I always love a unique beer. Even if it doesn't turn out the best, I love diving into the intrigue of a beer off the beaten path. 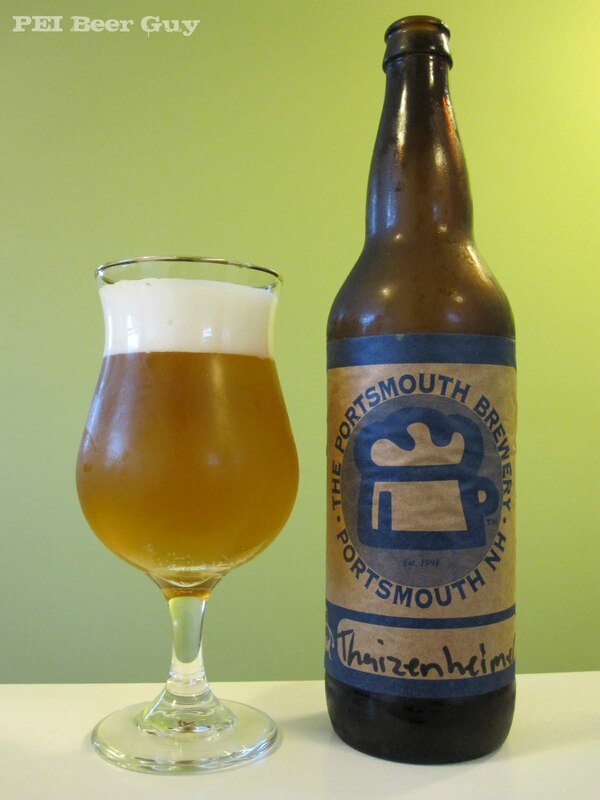 This Thaizenheimer is a twist on the Portsmouth Brewery's Weizenheimer, an American wheat ale. The twist is the addition of ginger, lemongrass, and kafir lime leaves. While not impressive, a decent little head comes from a hard pour, and a creamy skim of the just-off-white stuff remains on top. It leaves some broad webs of lace on the way down. Out of the bottle, the beer looked quite pale and yellow, but, as you can see, it has a bit of brownish depth to the colour. The aroma is mostly of strong ginger and lime, with some notes of honey and wheat. The ginger also gives an interesting almost-spicy aspect. The flavour has some of the ginger, but the lemongrass and (especially) the lime leaves take over here. Combined with the wheat ale base, this is like an Asian take on liquid American wheat field sunshine. Feel-wise, the carbonation makes a crisp tingle on tongue. The body is on the full side of light, with a smooth feel and some stickiness in the finish. That being said, what stands out most is the bright, acidic feel from the lime that lingers... it's kind of nice, and lingers at the back of your tongue and throat. This is coupled with an even longer-lasting, almost sour lemon-lime tang on the sides of the tongue. What separates some good beers from the rest of the pack for me is how memorable or different they are. This one is definitely unique enough to stand out from the pack, and, overall, this is a very nice beer (especially for summer). It would also do very well with something light like whitefish, chicken, or, especially, shrimp (Benjamin Buford "Bubba" Blue would be so proud).